The 37th Annual Decker Challenge is the third oldest race in Austin, behind the ARC Daisy 5K and the venerable Capitol 10K. The usual story of the Austin Runners Club Decker Challenge starts with the weather. But as our resident Kiwi Keith Dowland said before the race “the runners are spoiled”. 44F, zero mph wind at 8am, this is not your usual Decker weather. The only thing not forecast was the bright clear sky and sun, so it warmed quickly. The race was set up well with pacers for times from 1:30 finish to 2:40 in 10 minute increments, wearing bright red ARC race singlets. The race even accommodated training issues by allowing relatively late deferrals (up to one week before the race), either to the 2016 event (small charge) or to the Brown Santa 5K (free). This year the ARC asked runners to predict their overall times, for a new challenge. The race started right on time, a tribute to President Iram Leon and VP and Race Director Elaine Chung. And it went off flawlessly. The venue in the Expo Hall was a warm place to meet runners before the race. First overall male was relatively unchallenged. Matt McCurdy, a 38 year old recent transplant from Clearlake in Houston, treated today’s run as a fast tempo. A 2:28:59 marathoner (Chicago 2014), McCurdy runs for Team Mizuno. He ran Decker as part of an 85 mile week with no taper, passing the last challenger around mile 3. He finished at 1:13:22.7, just 23 seconds off his predicted 1:13. He is training for the Houston Marathon in January, looking to improve his Chicago PR. Second place male, Joseph McCellon 34, cruised in at a fast 1:17:03.8, also all alone. The real race was between 3rd and 4th. Presenting sponsor Rogue Coach Chris McClung 36 (first 3 males all have surnames starting with Mc and are in their 30s), was a minute back at miles 6 & 7, but Brad Walwer, 4th place finisher, appeared to struggle a bit on the big mile 10 hill on 973 (as did all of us). By the turn off Decker Lake Road onto Decker Lane in the final mile, McClung was just 15 seconds back. He finally caught and passed into 3rd place on the Expo grounds, finishing at 1:19:37.6, less than a minute ahead. First overall female, Tiffanie Marley 32, is also a recent transplant to Austin. Marley came from the LA area in California and is now a high school math teacher in Austin. Today’s race was a part of an overall 20 mile effort, with long warmup and long cool down. She followed the lead women through mile 5, then “picked it up”, finishing at 1:25:47.8. This was her first Half Marathon in 2-1/2 years. She ran for the University of San Diego and loves it here. Second place female, Sarah Jackson 27, ran her own race and finished strong, at 1:29:06.7. After seeing Marley go by, she had the race to herself through the finish. She is self trained, and unlike many of us, went up the mile 10 hill and then “the last 5K just flew by”. Nice. Third place female, Angela Vega 25, cruised in at a fast 1:33:03.3. USATF course certifier John Ferguson came down from his mountain home in Ouray, Colorado to run within 17 seconds of his predicted 1:38 time, on top of winning his age group. This was the 3rd race of the 2015/2016 Austin Distance Challenge. The next race is the Rogue Distance Series on Sunday January 10, the latest DC race to have unpredictable weather. Be prepared for anything, but it’s been chilly the last 3 years. A great 10K and 30K are offered, in the neighborhood of Cedar Park. The date for switching between the Half Track or Full options of the Distance Challenge is December 22nd. Half Track participants will run the 10K, Full the 30K. 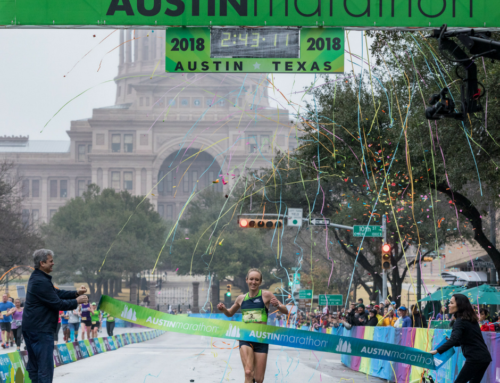 David Mitchell was the first 2 term President of the Austin Runners Club and Race Director for the Decker Challenge for 6 years, including co-designer of the Half Marathon course with his wife Muna (sorry about the last hill through the Expo Center).